A freelance writer who has been writing about digital cameras and the technology behind them since digital cameras first appeared. Digital photo frames are interesting products, giving you the ability to display a variety of ever-changing digital photos in a frame, rather than just hanging one photo on the wall. This is a great way to showcase all of your favorite family photos at once where everyone can see them, versus having them hidden in a scrapbook. There's certainly nothing wrong with scrapbooks for storing photos, as these will provide a more permanent option versus a digital photo frame, but the digital photo frame can be a nice companion. While most of them work easily, there are some tricky aspects to using some of the digital photo frames’ advanced features. Many times, problems with the digital photo frame can be fixed by resetting the frame. Check the frame’s user guide for specific instructions on resetting your frame. If you can’t find any such instructions, try unplugging the power cord, removing batteries, and removing any memory cards from the frame for a few minutes. Reconnect everything and press the power button. Sometimes, pressing and holding the power button for a few seconds also will reset the device. Some digital photo frames have power-saving or power-efficiency features, where you can set the frame to turn on and off at certain times of the day. If you want to change these times, you’ll have to access the frame’s setting menu. This can be a tricky problem to fix. First, be sure the frame isn’t displaying sample photos from internal memory. If you insert a memory card or USB device, you should be able to make the frame work with your photos. You might need to delete any sample photos from the frame’s internal memory. In addition, some digital photo frames can only display a certain number of files, usually 999 or 9,999. Any additional photos stored on the memory card or in internal memory will be skipped. If the frame’s LCD screen simply is blank, make sure that you’ve inserted the memory card or USB device completely into the slot on the digital photo frame. Depending on the type of photo frame you’re using, it can take a few seconds or more for a large resolution photo file to load and display on the photo frame. Some digital photo frames can't display files unless they’re compatible with certain formats, such as DCF. 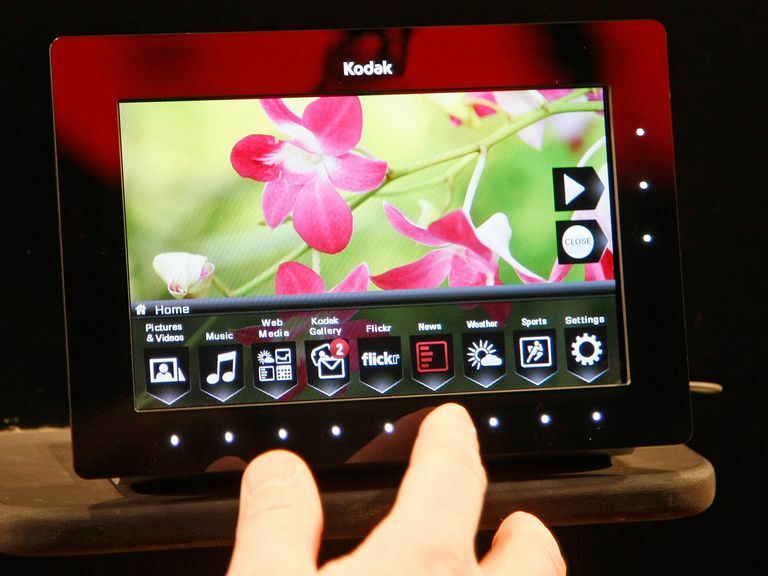 Check the user guide for your digital photo frame to see whether your device has this problem. Or, if some of the images on the memory card were edited on a computer, they may no longer be compatible with the digital photo frame. Many times frames not displaying pictures can be related to an issue with the files stored on the memory card. Make sure any memory cards you’re using are working properly — you might need to insert the memory card in a camera to test it. If the memory card has photo images stored on it from multiple cameras, it could cause the digital photo frame to be unable to read the card. Finally, try resetting the frame. Many times, this problem can be fixed by cleaning the LCD screen. Fingerprints and dust can make images look out of focus on the photo frame screen. If the problem with image quality is intermittent, it's also possible that the resolution at which a certain photo was shot isn't high enough to create a sharp image on the digital photo frame's screen. In addition, if you have a mixture of vertical and horizontal photos, the vertically aligned images may display at a much smaller size than the horizontally aligned photos, making some of them look odd and out of proportion. Check the battery of the remote control. Check that the remote sensor isn’t blocked by anything and that it’s free of dust and grime. Make sure you have a line of sight between the remote and the digital photo frame, with no objects between the two. You also may be beyond the distance over which the remote will work, so try moving closer to the digital photo frame. It’s also possible that there’s a tab or protective sheet inserted inside the remote that’s designed to prevent it from being inadvertently activated during shipment, so be sure that the tab is removed before attempting to use the remote. First, make sure all of the connections between the power cord and frame, and the power cord and outlet are tight. If it’s a battery-powered unit, be sure to use fresh batteries. Otherwise, try resetting the frame, as described earlier. Some digital photo frames are made to be hung on the wall, similar to a printed photo frame. Others will have a stand on which they rest, perhaps on top of a bookshelf or an end table. Hanging a digital photo frame on the wall that isn't meant for hanging can lead to a variety of problems. If you penetrate the case of the digital photo frame with a nail it could damage the electronics. Or if the frame falls off the wall, it could crack the case or the screen. Some digital photo frames can be hung on a wall if you purchase an add-on kit, so check with the frame's manufacturer. Finally, if you’re stumped on a particular problem with your digital photo frame, look for a Help button, either on the frame or as part of the touch-screen display. Help buttons usually are marked with a question mark icon. Why Are Photos Stored in a DCIM Folder? Are You Losing Too Much of Your Photograph to Compression?